We have two cemeteries in this parish; one of them is attached to the little church of St Botolph in the village (more a hamlet, really) called Botolphs right on the bank of the River Adur. On the Saturday after All Souls day this year we sought permission from the churchwardens there (there being no incumbent right now) to celebrate Mass before our November blessing of the graves. They were very welcoming indeed, and we are very grateful. I think that this was almost certainly the first (R.) Catholic Mass since the vigil of Pentecost 1559 (or whatever date you want to ascribe to it). It would have been a fine occasion to have celebrated something Sarum, or even Latin, or ad orientem, but that would have been too awkward to organize, and besides, it was really for the benefit of those whose loved ones were buried in the adjacent cemetery, and it was necessary to take their wishes into consideration. St Botolph's dates from around 950, so is very old indeed, though it has been altered over the ages, having had a gothic aisle built on, only to have it fall down again. If my memory serves me right, St Botolph is not the original dedication, which was St Peter de vetera ponte (i.e. over the River Adur)—there is no bridge right there now. I dare say somebody simply associated St Botolph with the name of the village. It has some traces of wall paintings, as you can see in the pictures, but they are only fragmentary, and not nearly so splendid as those in the next village of Coombes, half a mile down the river. Its only other claim to fame, I think, is that Archbishop Laud once preached there. Sorry—the pics seem to have arranged themselves in a strange order: I'm sure you can make sense of them, however. Am I alone in thinking that too many popes have their causes for canonization/beatification introduced? I read yesterday that Pope John Paul I's cause is progressing nicely. Surely one saint and one beatus is enough for the occupants of one job during the course of one century? It gets a little bit redolent of the early Roman Empire when all emperors were pretty well automatically deified at their death by decree of the Senate (and some of them even before they died). So, Pius XII, John XXIII, John Paul I, and John Paul II are all being considered for canonization/beatification. That is to say, all but one of the Popes since 1939. It begins to say more about those they don't beatify than about those they do. It begins to present beatification as a perk of the job. All those Popes were admirable men. Can't we just leave it there? I'm sorry to be slow posting these days; there are a lot of reasons, but no doubt things will improve and we'll be back to normal soon. The spirit of the fifth century is alive and well in Jerusalem, it seems. Greek and Armenian monks resorted to fisticuffs in a dispute over one of the holy places in the Church of the Holy Sepulchre. Read more about it here. The remains of a 19th century Birmingham Cardinal tipped for sainthood are unlikely to have been destroyed by soil acidity in a Worcestershire grave, an expert has said. Professor John Hunter, from the University of Birmingham, cast doubt on the theory after testing soil from an area near to the Rednal cemetery from which Venerable John Henry Cardinal Newman was exhumed. The ancient history and archaeology professor said it would be "unusual" to find a body buried in 1890 so decayed that no human remains were left. He said the soil tested was "not particularly acidic" and that he found it "difficult to believe" soil conditions near the grave were so extreme. Professor Hunter said: "It is very interesting from a forensic point of view to find a body that has completely decayed within this amount of time. It is very unusual and very unlikely. If we have extreme soil conditions that take away human bones, they would also take away coffin handles, which are still there. "I am not making any claims or accusations. I am merely looking at it from a (forensic) point of view." Prof Hunter said he chose to investigate out of curiosity and was only able to obtain a sample from ground near to the cemetery, not from the grave itself. He said there were three options: either the soil environment of the grave was different to the sample tested, bones were missed when the grave was exhumed or the body was never there in the first place. Relics that remain of the Cardinal - including locks of hair, a wooden crucifix and one of the coffin handles - were on display over the weekend at the Birmingham Oratory. 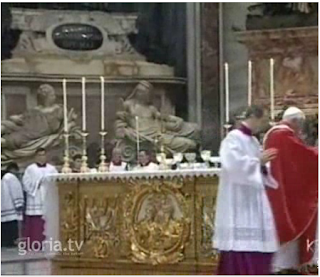 They will rest in the Chapel of St Charles Borromeo as the process towards his beatification continues in Rome. I am a Jew, and every single one of my ancestors was Jewish. And it does not bother me even a little bit when people call those beautiful lit up, bejeweled trees, Christmas trees. I don't feel threatened. I don't feel discriminated against. That's what they are: Christmas trees. It doesn't bother me a bit when people say, 'Merry Christmas' to me. I don't think they are slighting me or getting ready to put me in a ghetto. In fact, I kind of like it It shows that we are all brothers and sisters celebrating this happy time of year. It doesn't bother me at all that there is a manger scene on display at a key intersection near my beach house in Malibu. Or maybe I can put it another way: where did the idea come from that we should worship celebrities and we aren't allowed to worship God as we understand Him? I guess that's a sign that I'm getting old, too... But there are a lot of us who are wondering where these celebrities came from and where the America we knew went to. H/T O cuniculi! Ubi lexicon Lainum posui? 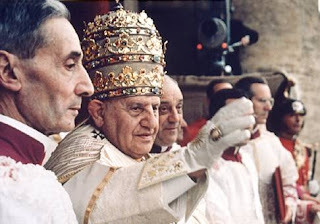 Today, 4th November 2008, the feast of St Charles Borromeo, is the 50th anniversary of the coronation of Blessed Pope John XXIII. You may remember that way back somewhere BC, I posted a series of videos with commentary which, for complications not worth going into, I had to later delete along with the rest of my blog. Well, today seems a good day to start reposting this, with, I hope, a rather longer commentary—which I hope people will contribute to. No doubt I will make mistakes, but if others are willing to correct them, then all will be well. This time I've decided to dedicate an entire blog to the videos, which will be tidier than people having to search on this one. It will probably take a while to complete the series, so please be patient. 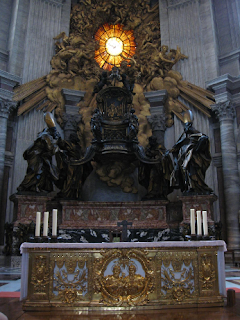 I saw yesterday on Rorate Caeli that the strange new altar of the Chair in St Peter's Basilica had been replaced with something more fitting. I'm grateful to Fr A.W. 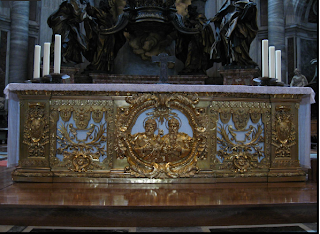 for sending me a link to some much better pictures of the new altar, which you can find on Rinascimento Sacro, here. It is certainly another step in the right direction. Mind you, a small voice inside me wonders where they got it from: is this a case of robbing Paul to pay Peter? And perhaps Paul could be persuaded to dig out some nice candlesticks, too.